Quick Links: WTF? Oil Filter question Great Knife idea CB Radio Restocking my house opinions needed on best knives, pots and pans? 2016 Christmas Gifts and BS Garmin Map Updates? Discussion in 'Off-Topic Discussion' started by corywilson13, Feb 25, 2008. I got my first truck when I was 16, It was a 1989 Toyota Pickup, then after about a year, 25000km, a headgasket, and some rust, I sold it for more than I bought it for. 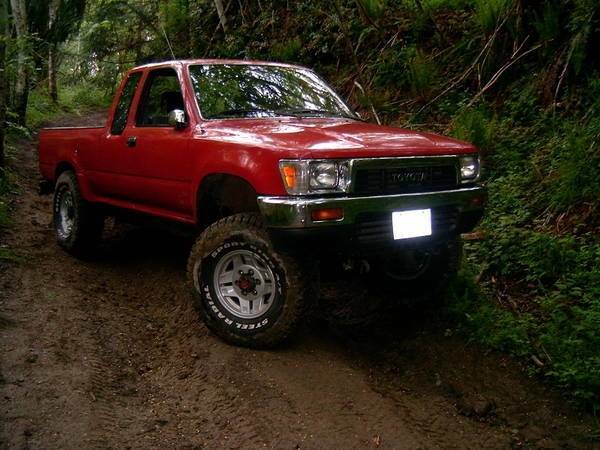 I then bought a 97 honda civic, and it ran excellent, but I just am not a car person so after owning that for 6 months or so I bought a 1985 4runner, yes it had it all, convertible, EFI, Solid front axle, It was a great truck, but not reliable enough for a DD and quite rusty, I only used it as a weekend vehicle, as I had the civic at the same time. I sold the 4runner last fall. I was truck-less for almost 4 months, I just couldn't handle it so I bought a new taco, yummy taco. 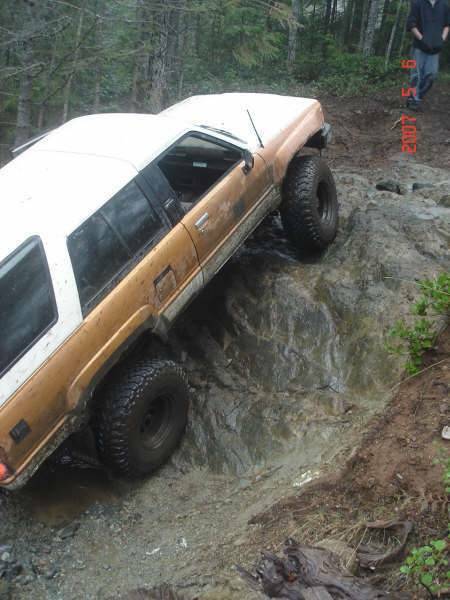 Here are some pics, and please share your vehicle story. Have you always been a toyotaguy? Ive wanted a taco since I knew the difference between a truck and a car . hmmm...no pictures here, but I'll see what I can dig up later. At 105,000 miles, Engine threw a rod. Don't know how many miles, Odometer stopped working after 200,000 miles. 70,000 miles. Transmission was questionable and then the motor mounts started going out before I could worry about the transmission. At one point, I strapped a Jacuzzi tub to the roof of the Lincoln, which prompted my wife to finally admit that I needed a truck. I traded in the Lincoln when it looked like she was about to die for my Tacoma. Anybody want to buy a Harley? I heard that harley stocks are falling in the US because people are selling them to save their houses. Damn that's unfortunate. I only have pics of the Taco. It's the only one worth seeing anyway! I'm not surprised. It's a decent bike but the maintenance is brutal. I put 45,000 miles on the thing and had to have both the top and bottom ends rebuilt. They recommend an $800 service every 10,000 miles. My Triumph? Just 2 oil changes. I do go through tires a hell of a lot faster on that Triumph. The Harley's been collecting dust since I went British. It's just a great bike. 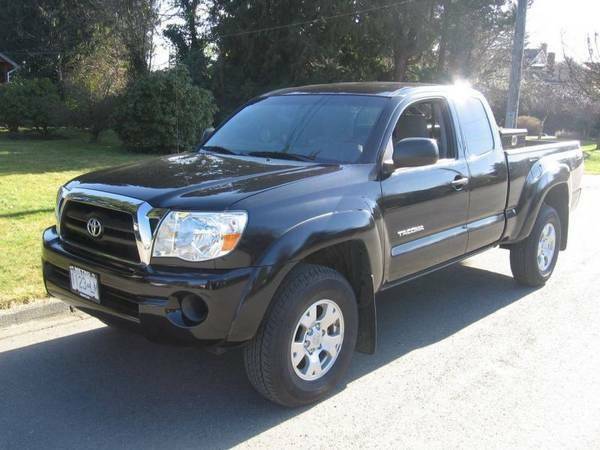 The Harley's gonna go cheap and will help offset the financial hemorrhaging that I'm experiencing with my Tacoma. Well im only 19, so my list is somewhat short. 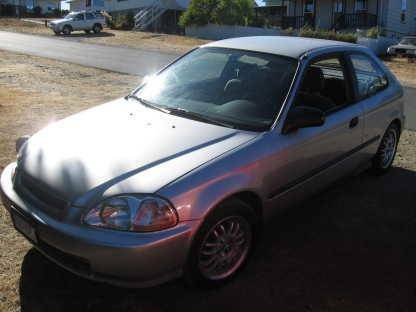 At 15, I got a new 2005 civic to share with my dad on his commute days. I soon gave up on the civic and drove the 1999 Silverado 1500 Z71 we had sitting in the garage for the 1/2 mile commute to school. Traded the Chevy with 130k+ miles [no major problems the life of the truck, but it was getting there]. I now proudly make payments on my 2007 Tacoma PreRunner. Along the way i have also had various dirtbikes, the latest being a CR250. I rode a HD Sportster which we [dad] dumped too much money into, and a XR650L. Slowly saving up for a bike but my truck keeps stealing from the bike fund to pay for its mods. Cool question. I`m sure I forgot a couple. I forgot to include the car I've been driving since October. It's my daily driver until the truck is out of the shop. Now thats the perfect kind of car for someone who wants to save $$$ on gas and keep the milage down on there Tacoma. 88 Dodge 600 - passed down from the folks in 95 when they were told it was gonna die. Drove it for a year, blew a connecting rod out through the oil pan. Rebuilt the engine over the course of a year, drove it for another year, then drove it to the junkyard. 04 Scion Xb - My 1st brand new car....had family needed economical 4 door...another great car. Gawd... I guess I do have a problem! How about "what vehicles have you pwned?" Entire Site Forum: Off-Topic Discussion Thread: What vehicles have you owned?